This just keeps getting better and better. Just need some people, some black and white photography and I bet it would be close to perfect. The scenery really looks great with all those grasses and weeds! Wow, some fine looking scenery Jeff !! thanks. I tried some glue that I saw in a YouTube video from the guy that invented Silflor. David Frary did the video and pointed out a glue that was being used, I went and bought some at Michael's. this stuff works great stick down Silflor Tufts and other scenery materials. 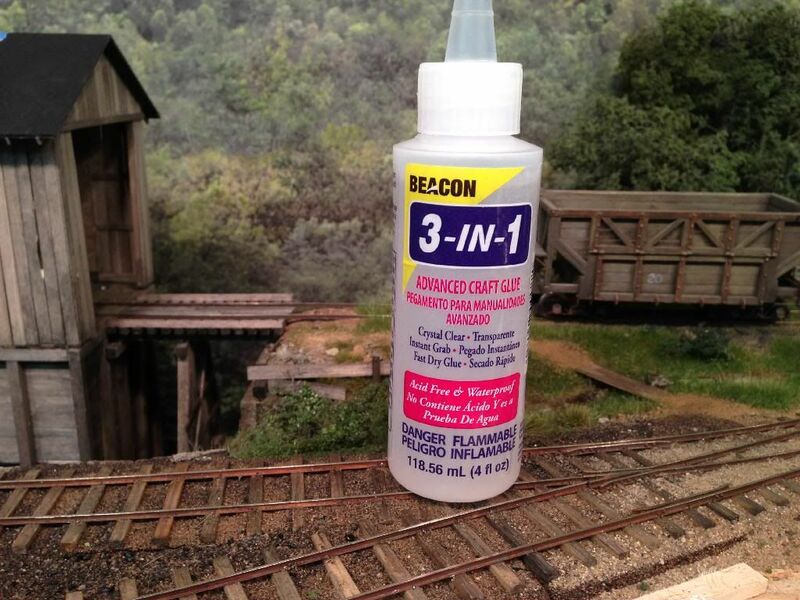 The stuff I got is called Beacon's 3 in 1, it is clear, thick, and very tacky. It works well because it instantly sticks the stuff in place without having to hold stuff down. it is very fast to use. 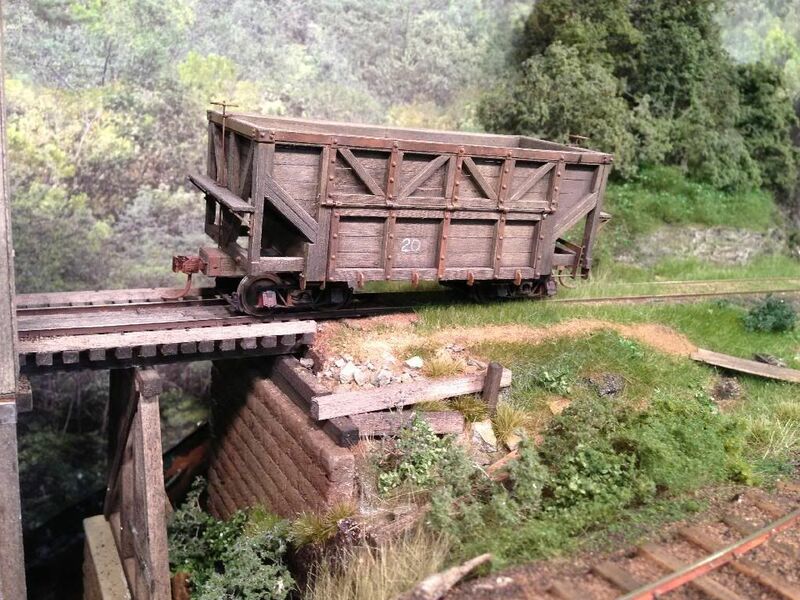 Pity the poor brakeman that wore that path crossing the planks and ending at the edge of the drop off. Thanks for the tip on the adhesive. I had never heard of it. No toe stepping intended here. Tempered masonite/Hardboard in the 30's and 40's was indeed impregnated with Tung or Linseed oil before the heating/ baking process. As such, it had a high residual amount of left over oil in it and on the surface. It is also why it was so dark in color and dense. 20 years ago, when building cabinets we used good old fashion solvent based glues for laminating and veneering. I recently looked at some store fixtures I built 23 years ago and they are still holding up. Like almost all contemporary panel products (cheap), manufactures of tempered hardboard have all but eliminated the oil in the board. Very little is used now for the hardening process. It flashes off in the backing process. I just installed 9 sheets worth of "tempered hardboard" on a clients layout. It was light brown in color and not much harder than untempered and as absorbent . On a previous project, it was glued and painted 3 years ago. No problems with pealing paint. Since I do not by materials from Home Depot type stores or from places that sell Non- CARB compliant products, it may just be an issue with Home Depots products. Since their idea of "contractor grade" is really shop grade at most wholesale suppliers. 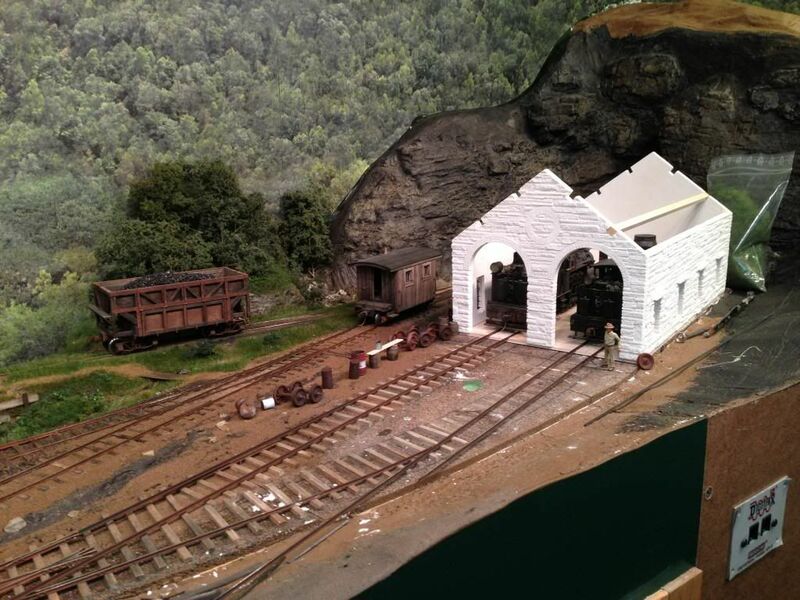 The nice weather is still staying away so I have had a little more RR time, so I started messing around with my engine house scene. 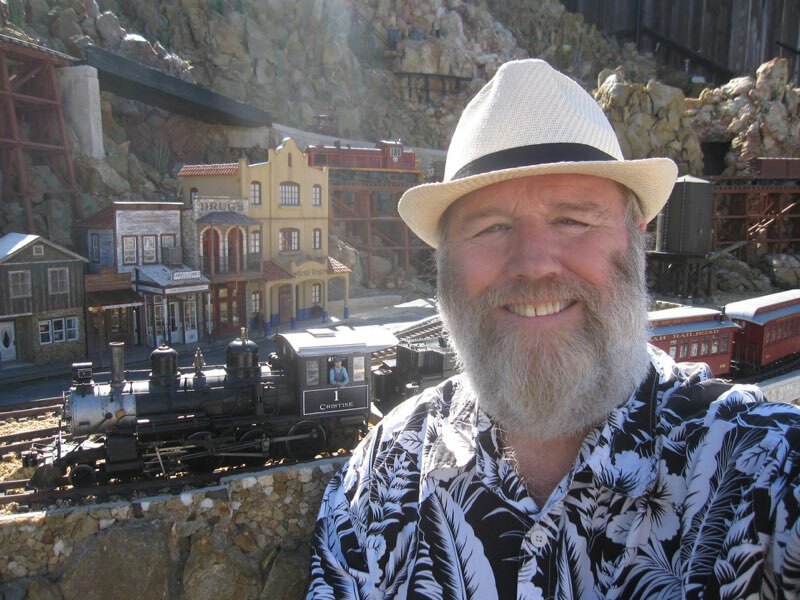 If you followed my post for a while you know that I was debating weither I wanted to build the Manns Creek's stone engine house or build a wood engine house. 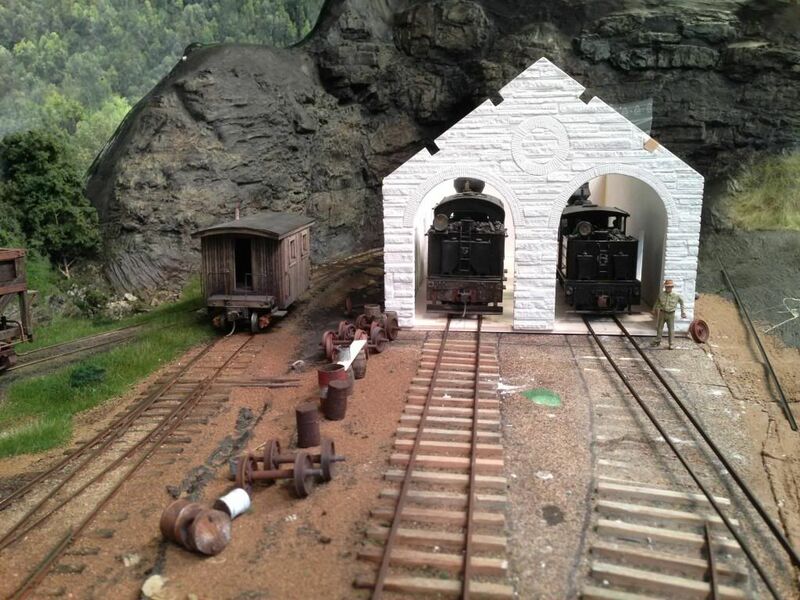 I really wanted to build a wood engine house with an attached machine shop for my layout. 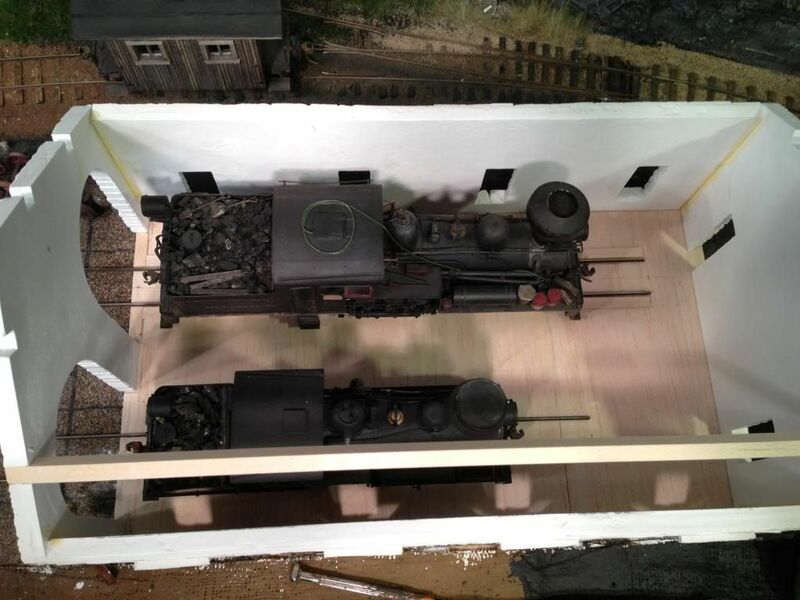 I changed my mind and purchased the Stromburg cast MC engine house, however after I got it I found out it was downsized for small On30 locomotives and I was worried my #8 shay was not going to fit. I then decided once again to build a wood engine house. Well last week I changed my mind once again to use the stone engine house. After some mocking up I found my big shay would fit find and I figured that in my minds eye the stone engine house should be there. So last week I stared the process of gluing the castings together and collecting junk to lay around inside and out. 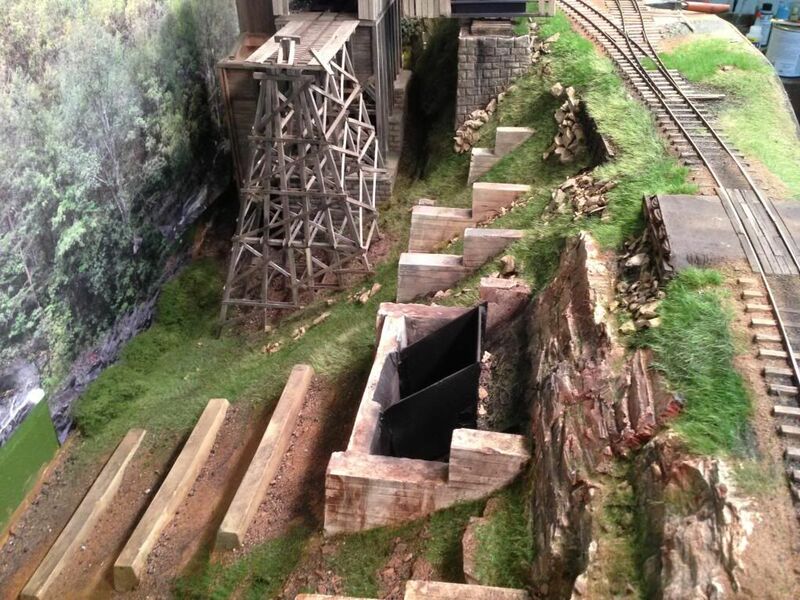 From what I have been told the real MC engine house had a dirt floor but I am goin to make mine wood. I made one track full length for the big shay and the other track I made a bit shorter so I can have a small work area. Fantastic job on the grass, the engine house is appealing. Looking good. I like the rust stains on the concrete footings. 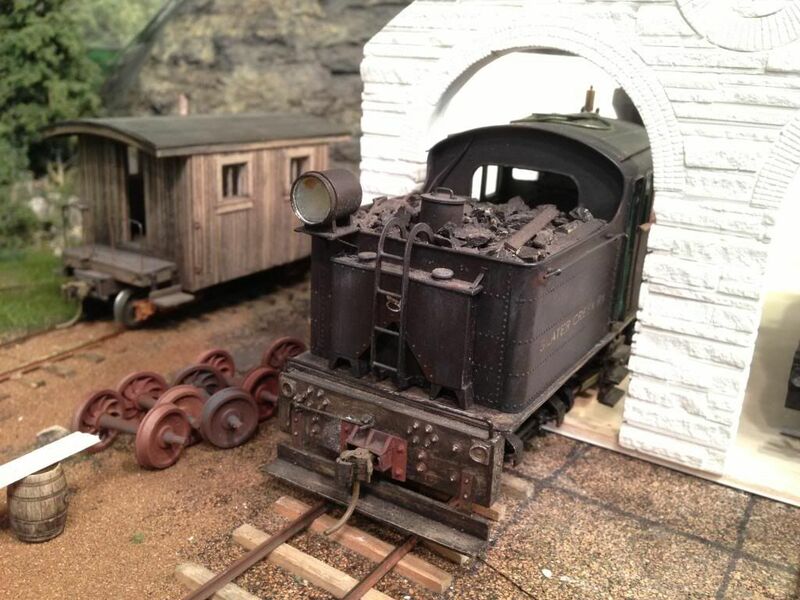 If you have been following my post you already know how all this operates, but I had a lot of questions on my Youtube video about how my coal hoppers work, so I thought I would post a video update. What is new on this video is how the air blow down operates. Another change I made is I switched from washed real coal to black aquarium rock. The real coal looks better (and smells better) but the rocks are absolutely dust free (and it stays that way). The black rock also empties better, it is a little heavier and it has rounder edges which eliminates "locking" in the hopper, so much so that I could almost due without the air blow down, however the air still helps get it all out for sure. An interesting thing was happening with the coal, if I left a hopper sit with real coal in it for a while (weeks) it would stick to the styrene slope sheets, the points on the pieces of coal would slightly embed into the styrene.